Today we’re going to talk about what it looks like inside one of my consult calls. Have you ever wanted to sign up for a consult call with someone but you’re just not sure what you would talk about? Or you wonder if you are actually going to walk away with answers to your questions? Or just more questions. Me too! Each week I do anywhere between 2-4 consult calls with people in all levels of Pinterest marketing. Some advanced, some intermediate and some without a clue! Regardless of skill level I don’t change what I talk about, I just decide how I deep I can go. For some, I’m careful to not add too many to-do’s to the plate. We all know keeping up with a website is a full-time job. You don’t need someone on the other end giving you a never-ending list of action items. For others, it’s go time and they are ready to tackle their to-do list the moment we hang up. What I want to do today is walk you through one of my calls, but instead of having someone else on the other end, I’m going to talk with you. We aren’t going to touch on everything I would during a consult call because I don’t know your individual needs, but we will work through the high-level stuff. So print out the free consult call checklist below, take out a pencil and get ready to take notes. We’re going to go from Pinterest to website. I have my name and two things that I do — Pinterest marketing and management. You know I’m not just about social media or blogging, but I’m about Pinterest. Profile picture — does this also communicate you? Be sure to keep this crisp, clean and consistent with other social media platforms. Then we move to your boards. Do you have a board on the left devoted to your content? (products, links to blog posts, etc). If someone is searching for you on Pinterest, not only do they get your profile but also your board name when they click on boards. Maximize search baby! After that, do your boards communicate your message as well? Not only does this solve the problem of keeping a cohesive message, but it also keeps you on track when you’re pinning. It reminds you of your focus and who you are aiming to serve. Did you uncover content that doesn’t match what you blog about or sell? Move it to secret and pin there as needed. I’m always pinning things for our addition/remodel and those go to my secret board. They are pins that I edit the descriptions to remind me why I’ve pinned it. You can have as many secret boards as you want. Now this doesn’t mean if you have a board on there that doesn’t directly serve your audience or you don’t blog about, you’re doomed. Keep the board and don’t stress. I’m mostly talking about those people who created a personal profile a long time ago and they have moved to a different focus and their Pinterest page is still a hot mess. Like my hallway closet. Let’s take everything out and make some sense of that hot mess. Next, I’ll hop over to the site and ask a some questions. Does this make sense to me? Do I know what they are blogging about? Can I easily find their content? I really like the ‘start here’ tabs or buttons because they give me a prompt as I’m looking around. Am I hit with a huge pop up right away? And is it enticing to sign up? Now let’s look at an actual blog post. For those of you who are listening right now and you have a product, sales, or service-based business, one way to hook people in is by having a blog/content creation side. This is the type of content to pin to Pinterest. It’s a welcome into your business that tells of your value. Tell them why you’re helpful, why your product is awesome and how you’re going to help them through the blog side of your business. Assuming you have a blog, are there three elements in place on each blog — social share buttons, vertical Pinterest image, link to your email sign up (freebie)? A bonus element would be monetization. You want to make money right? For those selling products, during my consults I’ll often find that people have neglected this side of their business, as they are busy creating products. I absolutely get that. If the blog side is something that feels overwhelming or you can’t tackle it, consider hiring a writer and/or someone to create Pinterest images for you. This is a really important element to Pinterest marketing. You can’t just slap up pictures of products and expect people to buy. Give them multiple ways to enter the door of your online business. Now let’s be conscious of those that are coming via mobile. Is your site mobile-friendly? Do the social share buttons pop up on mobile? Is the newsletter sign up form easy to find on mobile? Remember, if a user is on mobile, then the side bar is irrelevant. Most of us make the mistake of putting a ton of great content in there but forget to put it inside the post. For me, I like to make sure my email sign up is in each post and that it’s working on mobile. I use ConvertKit and my form pops up on mobile towards the bottom of the page. 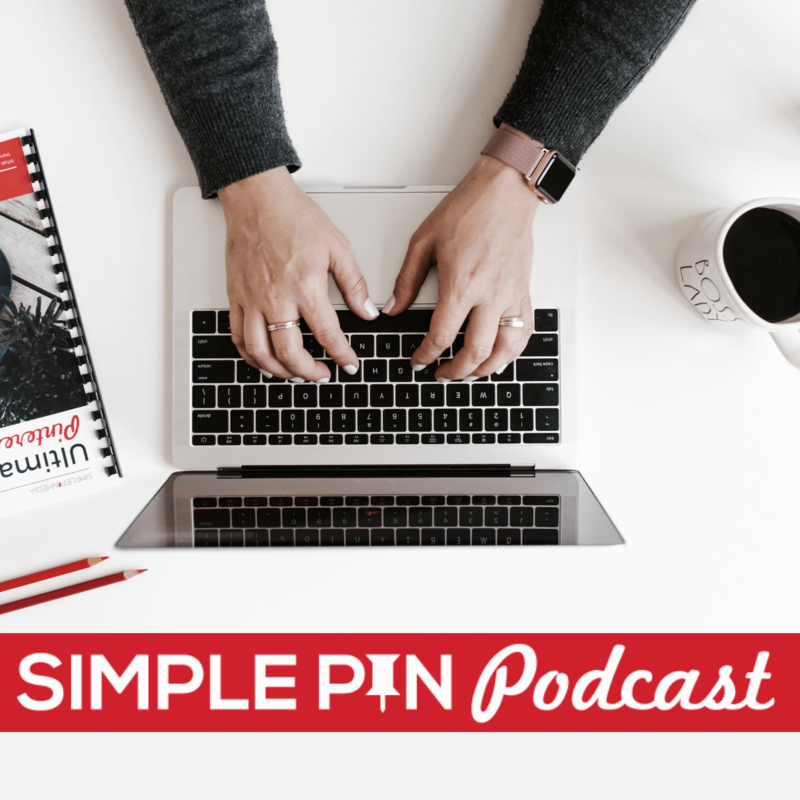 Then we touch a bit on Pinterest strategy — how often to pin, what to pin, where to pin and the programs I use to make it efficient. If they are struggling with analytics, I’ll send them over a dashboard template that we use here at Simple Pin to quickly look at what’s happening with Pinterest traffic. At the end of each call, I go through a recap of what we have talked about and give them at least 3-5 action items based on that. This gives them an initial place to start. I also give them a few minutes to answer questions and then let me know if they have any more questions. Hang up and I’m off to the next task. That’s the consultation process in a nutshell! If you’re looking for help developing a Pinterest strategy for your blog or business, I’d love to help. Click here to learn more about our services. Is there something else about the consultation process you’d like to know? Leave your question in the comments. Make Pinterest work for you. Download our FREE Pinterest Consult Call Checklist to optimize your Pinterest branding, website & strategy. Kate, how great to get on your exsellent blog. I want to join to the Simple Pin workshops. But… I’m a Russian blogger. Will I manage it? Your english seems good and you can watch the videos as much as you want to process the info. Is that your only barrier? Pinterest is a bookmarking web page that helps you discover and save creative ideas. Pinterest offers a range of activities you can initiate to market your company to a new audience like in any other social network. The goal is to gain brand recognition, drive traffic to your website and be successful at converting the new visits into leads. Now-a-days, Several brands have started launching contests using Pinterest and this steps proved as beneficial key of business model. Thanks for sharing your healthy experience with us. Hi Kate, I am looking for someone who can tell me whether I need to create a separate pixel for separate adverts inside Pinterest? You only need 1! And you can customize them based on what you need to do, but adding a main one to your header is sufficient.